SteriPEN Camp & Hike Classic 3 Water Purifier w/Pre-Filter SPPFMPEF. Classic 3 purifies water using ultraviolet (UV) light. Whether your source is a clear running brook or a hotel tap Classic 3 destroys viruses bacteria and protozoa including Giardia and Cryptosporidium in seconds. 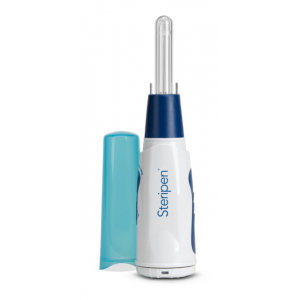 To purify 32 oz of water the SteriPEN only takes 90 seconds The 4040 micron screen Pre-Filter fits perfectly on wide-mouth one liter water bottles and removes particulates that can get in the way of UV light in water. The Pre-Filter is designed to be stored directly on a wide mouth bottle and the SteriPEN Classic 3 fits perfectly in the filter. Just insert Classic 3 in the filter opening turn the bottle upside down and gently rock to circulate light throughout bottle.